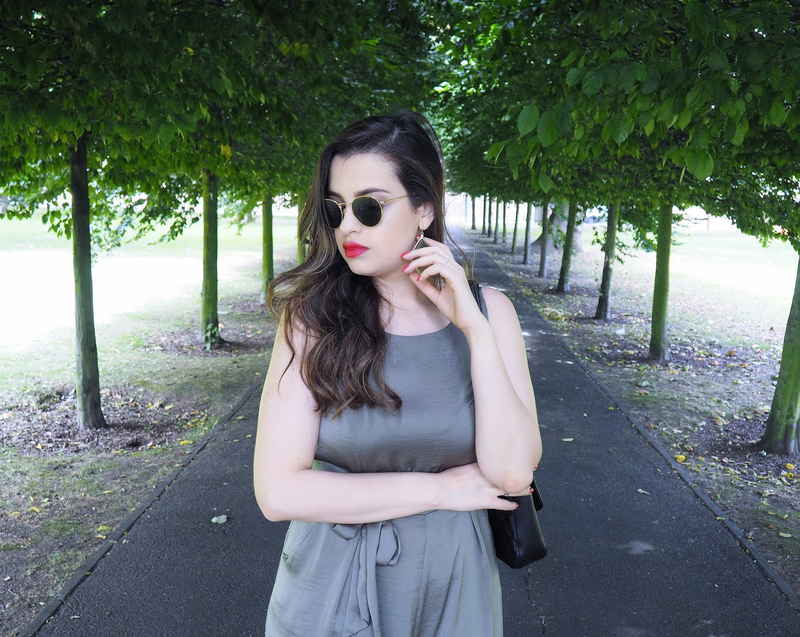 With my summer holidays finally just a few weeks away, I've been putting together a list of everything I wish to take and needless to say it's basically my entire wardrobe. I ridiculously over-pack every time so in the attempt to cut down the amount of clothes I take and bring back intact and unworn, I have been trying to find pieces that are easy to throw on as well as lightweight to endure the 30+ degrees heat of Algarve at the end of the month. Enter this gorgeous Satin Wide Leg Cropped Jumpsuit from the newest Abbey Clancy's Picks for Matalan. It's safe to state that 2016 has seen designers take inspiration from various fashion eras, and the flare-wearing comes from the 1970s which I briefly talked previously on the blog here. 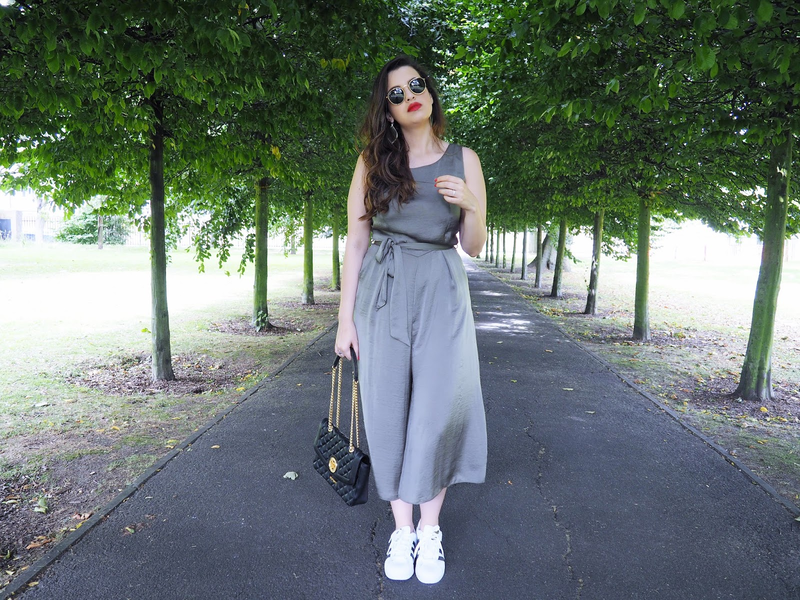 With seventies throwbacks on the catwalks (S/S 2016 and already A/W 2017), find yourself a cropped flared jumpsuit and you will be rocking it now towards the end of summer and right through autumn too. And that is exactly what I thought when I saw this jumpsuit. Not only is it perfect for me to take on holiday for a night outing but this elegant one piece is the perfect replacement for the cocktail dress for a classier event. And, we all know what khaki means, the military look never truly leaves us and is always on trend. Just this morning I saw a girl wearing khaki head to toe and boy, did she look stylish! And despite being army-inspired or modern-safari, the colour makes this jumpsuit very feminine and I’ve seen a lot of khaki on the high street with a much more feminine essence. If you think khaki only works for autumn and winter, think again as khaki has recently been in the spotlight for spring/summer too, making it an all year round favourite shade. Not only does the colour work great with most skin tones, pair it with denim, both white and black accessories, or even wedges and you are ready to go. Abbey Clancy being the classy woman she is, styled the jumpsuit with black barely there sandals (see here) and I love how chic the look is. I, on the other hand, being the most casually dressed person you will probably ever meet, thought to team it with my trusty Superstars because I like comfort and a bit of edge. Didn't I tell you it goes with almost anything? Versatility here really is key and as one would expect, I definitely see myself wearing this jumpsuit on repeat in the next few months. Waist clenching, figure hugging and lightweight material, this a must-pack this season! What do you think of this jumpsuit? Have you added one to your wardrobe this season? wow, you look great, love the choice of a red lipstick for that awsome jumpsuit! Love your styling... Really awesome. This jumpsuit looks amazing on you! It looks comfortable for the entire day. Taking it from morning to night would be a breeze too! Love the sporty look Pam! Great styling! I love how you styled the jumpsuit with the sneakers. The material looks like a dream, but I just cant figure out how to make the cropped trend work for me. Um look giro e confortavel para os dias quentes de verão! This is so pretty! I have never seen anything like this but I love it! I don't think it would look great on me but on you, stunning! Such a gorgeous jumpsuit, love how you wore it too! hey, what a nice comby with the sneakers! greetings! WOW! You're absolutely gorgeous! Such a beautiful look! I just followed you too :D Great blog! Suits you so well. I haven't added a jumpsuit to my wardrobe for summer yet and I really need to. This looks amazing on you Pam! Will be perfect for your holidays! Okay. I want to get that jumpsuit too! I love the styling! I can tell just from the pictures this look is so comfy! You look great, Pam! Pam, you look divissima! With a pair of heeels in the suitcase, you can wear this lovely jumpsuit in the evening during your holidays... Great red lipstick! Jumpsuits are so much fun to style and we love that you paired it with those tennis shoes! You look very chic! Such a great sporty look! The jumpsuit is beautiful and suits you very well. Fica tão bem com as Adidas! It really goes with everything, dear Pam, I am very sure of that! I can picture you wearing it with heels as well! I loved the color, military but so feminine! I love satin and cropped style, so this is a perfect piece, in my opinion! You are always so gorgeous! Hope you have a very beautiful evening! Stylish and so beautiful! I love that jumpsuit on you, Pam. Suits you beautifully. Such a beautiful jumpsuit! I'm in love with your sunglasses too! This outfit is just perfect, I love the fabric. You look great hon. Muito lindo o look. Arrasou nas fotos. I love it, and I love that red lip!!! Those Superstars go with everything. Amazing jumpsuit with the sneakers! Lovely look dear, you looking so good! you look great! I love the jumpsuit!